Year three fractions worksheets get your child learning about halves and quarters. Your little learner will get an introduction to fractions and graphing with pie charts ... some are even made of real pie! These year three fractions worksheets get your child to learn fractions in a fun and friendly environment. Our collection of worksheets helps your child stay engaged through clear instructions and colorful designs. 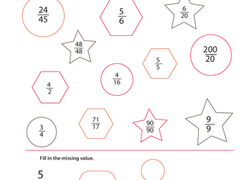 Use these year three fractions worksheets with your young mathematician. Ask your students to review how to add fractions with a common denominator, then try solving the addition equations on their own. Is the fraction 2/5 less than, greater than, or equal to 2/8? Use this two-page worksheet to help you assess your students abilities to compare simple fractions using both pictures and numbers. 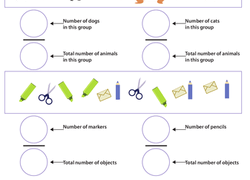 Help your child wrap her head around fractions of groups with this worksheet that spells out the idea in clear terms. After reading the example, ask your students to solve 15 different subtraction equations between fractions with a common denominator. Let's go flying with fractions! Help your child grasp the concept of fractions with a great visual aide. He'll get to make fractions in picture form. With this worksheet, your students will earn about equal and unequal part. Get ready to divide these brownies! 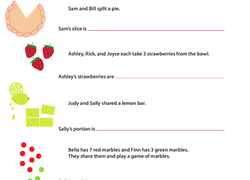 Your second graders will have fun learning about equal parts with this delicious worksheet. They will be tasked with dividing brownies into halves, thirds, and fourths. This is sure to make their mouths water! 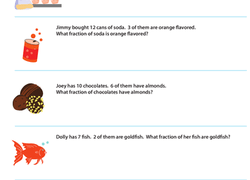 With this worksheet, your second graders will match a picture of a fraction to the correct maths sentence. If your child has a hard time understanding the difference between parts of a whole and parts of a group, this worksheet is sure to clear things up. Get your second graders ready for some fraction fun! This resource has circles that are divided in halves, thirds, and fourths. Your students will determine what fraction of the circle is shaded. Need fraction practise? This worksheet is sure to fit the bill. Kids flex their fraction know-how as they write fractions to describe each group of objects. In this worksheet, kids practise identifying fractions equal to 1 by coloring them in and completing fraction equations. Kids usually think of fractions as a part of a whole, but they can also describe a part of a group. This worksheet helps kids grasp this tricky concept. Help your child get a leg up on fractions with this worksheet that challenges her to read each paragraph and write the fraction that goes with it. This fun cookie worksheet will help your students learn to divide cookies into halves, thirds, and fourths. Are fractions seeming funky to your child? Give him a helpful visual tool with this fun bowling for fractions sheet! He'll colour fractions of bowling pins. Instead of boring maths practise, let's go bowling! Your child will love this fun fraction sheet, where he'll get to colour the fraction of bowling pins hit. Get ready to have your class thinking about thirds! This worksheet will have your second graders identifying different fractions of thirds.